Record your holiday – there’s an app for that! There are oodles of apps to assist with travelling, from flight trackers and sat nav apps to 3D maps but we’re looking at a handful that make trips fun for kids. Travel apps can provide a much needed distraction on long journeys – whether you have the kids keeping track of distance, creating a photo journal or penning a postcard to their grandparents, there’s an app for it. Start with Trip Journal. At first glance you may think that this sophisticated app, chock-full of bells and whistles, is too much for children to handle but think again. Firstly, use Trip Journal to track, record and document your adventure. The app integrates Google Earth so that you can easily track your travel route and stopping points while adding photos, videos, comments and even blog entries. My older boys also like to check our trip stats – distance travelled, time it’s taken and so forth. Adding photos and comments is manageable for kids and whilst I might not have chosen to note on a recent road trip to Canberra that a particular country town has “…the most awesomest ice-creams ever!”, it was a highlight for the kids and eagerly recorded in their Trip Journal. It’s the sharing features of Trip Journal that set it apart from other travel apps. Trip Journal allows friends and family to easily see your travelling routes, photos, videos and comments and is integrated with various social networks and content sharing portals such as Facebook, Flickr, Twitter and YouTube. 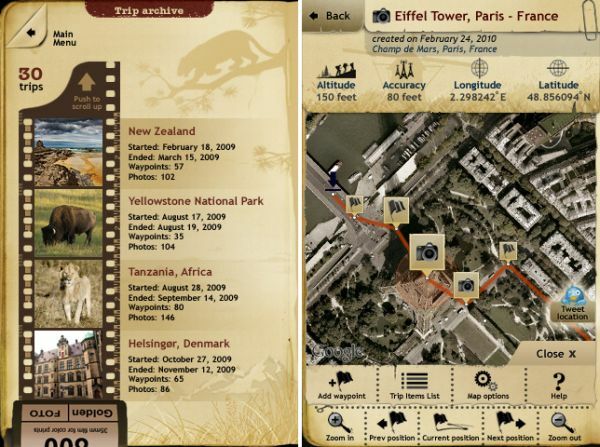 Trip Journal is available for iPhone and androids for $3.99 from iTunes. Similar in function is My Vacation. 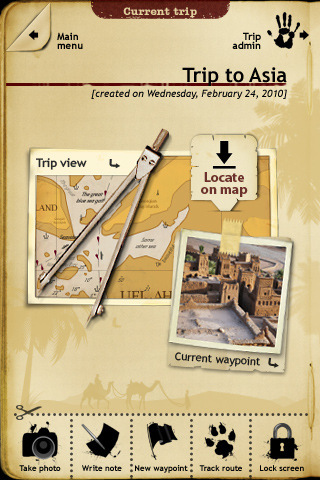 My Vacation has the added feature of trip planning and uses maps and photo playback in a different style to Trip Journal. The video clip below shows how it works. My Vacation is $3.99 and is available from iTunes. A high definition version is also available for iPad. The modern way to say “Hey Nana and Pa, we’re at the Big Banana!” is with an electronic postcard. My Vacation has a neat postcard function but there are lots of others. One of the first electronic postcard apps I used was Postman, available for $3.99. It’s simple, easy to use and you can jazz up your photos with various themes. My kids have no trouble designing their own cards with this app and ‘mailing’ them to family and friends via email or various social networks. However, the world of app development is fast-paced and there is lots of competition for the trusty old ‘Postman’. Also check out Postcard ($2.49 via iTunes) and Postcard Express (shown below, $1.19 via iTunes). 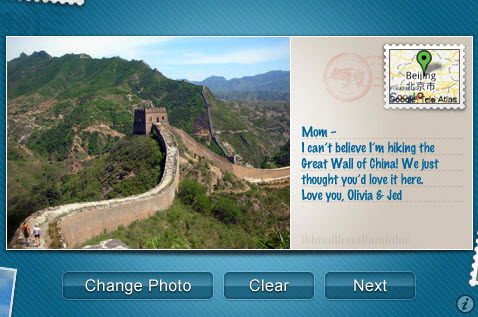 There are a bunch of apps that allow you to create and send ‘real’ postcards, bridging the gap between old and new technologies. It’s worth reading the reviews of all of these apps carefully given that you are ‘paying per use’ to create postcards. These apps all work the same way – use the app to select photos from your phone’s album, design and write your postcard (there are generally templates or you can start from scratch) and access addresses from your Contacts. Once you’ve created the postcard, hit ‘send’ and a real postcard is sent from anywhere in the world to anywhere in the world – fun for kids, as long as they’re not sending moment-by-moment memories to every kid in their class! 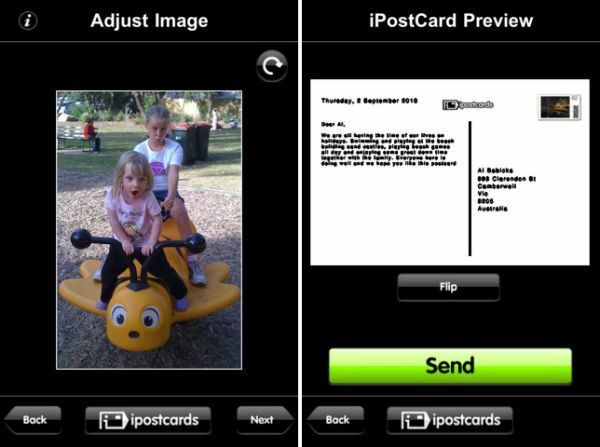 Check out iPostCards or Postino (both apps are free to download but then you pay-per-postcard after that). The very best thing about these apps (and the same applies to any journal, scrapbook or photo album) is looking at it after the event – kids certainly enjoy looking back on their handiwork and reminiscing at the same time.